Bring your PERENNIALS over when you divide yours! Or donate seedlings/seed potatos, and organic seeds. Preferably your edibles, but flowers of all sorts welcome. We can also use any bamboo your thinning out to construct teepees for pole planting. We still need a wheel barrow or cart - hoses too! And either a cow or an alternate source for good compost. There's also expenses entailed with our workshops, and many programs we hope to roll out in the future, that could be yours to underwrite! We are the Garden of Hope. We Hope for your support. 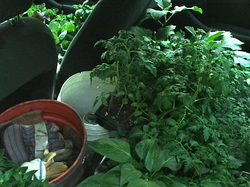 Thank you..
careful: an entire car full of plants! Thanks to Ossining's Pinesbridge Nursery!